Simon the therapy dog radiated a deep calm as he stretched out on the library floor, smiling students all around him, stroking his soft fur. His Buddha-like demeanor was perfect for his task: calming stressed students. 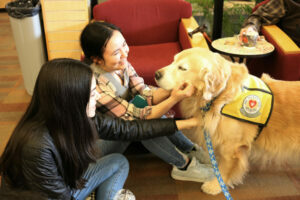 The golden retriever was part of a two-day program during finals week that gave students an opportunity to interact with a trained therapy dog and forget about big tests for a moment. Vivienne McClendon, Dean of the Library Media Center, says the regular event is hugely popular and is just part of a series of supportive steps the library takes during finals week. They also offer Legos, a drawing station, and snacks in addition to extended hours. “We try to have some fun outlets for students to relax and take a break,” she said. She’s certainly right about the pet therapy being popular. Two students at Thursday’s session said their finals ended on Wednesday, and they came back to campus the next day just to see Simon. McClendon said that she tries to book different dogs each quarter so there’s some variety for regular “customers.” In that vein, she also said that someday she hopes to book a therapy alpaca. Don’t tell Simon—he’s trying to stay calm.